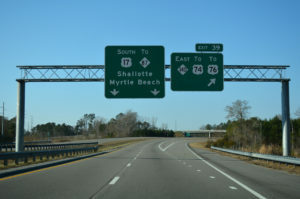 Shawn Evans, partner with The Law Group, attended the most recent DOT Public Hearing for construction planned at the Smith Avenue and U.S. 17 Interchange in Shallotte, NC (U-5862). At this time the Department has select ed a “preferred alternative” for construction and announced they plan to begin right of way acquisition in the Fall of 2019. The Department plans to construct the current at-grade intersection into an overpass with traffic circles on each side of U.S. 17. In order to complete this project, the Department will be taking a significant amount of privately owned property on both sides of U.S. 17. Based on the preferred plans, approximately 35 properties will be impacted by takings for this project. If your business, home, or investment property is impacted by a taking, please contact Mr. Evans for a free consultation 910-251-6088.